On Tuesday February 27th, dozens of curious students, eager entrepreneurs, and industry professionals gathered in the heart of downtown at ONRamp in celebration of the highly anticipated UofT Entrepreneurship week. That evening marked a semester of continuous collaboration between ICUBE and multinational information firm Thomson Reuters, over a women in tech initiative, with our 2018 Women in Tech Panel. Donna Heslin, Director of ICUBE, started the evening workshop off by discussing the impressive growth in tech sector jobs in Toronto, exceeding San Francisco and New York for 2017. Senior Managers at TR, Julie Roussin and Leyla Samiee, shared with us the strategies and practices they have mastered to maintain this growth and utilize the high quality supply of women in this field. University of Toronto Assistant Professor Sonia Kang discussed her research of strategies to harness diversity in the workplace and how inclusion supports building a stronger workforce. 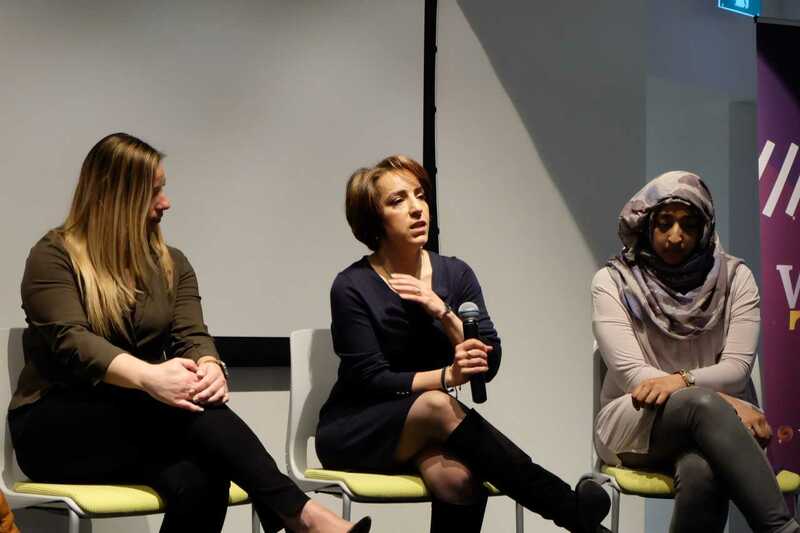 CEO and innovator of Dot Health, Huda Idrees, spoke about the abysmal rates of defecting talent, how to retain them, and where do startups fit into immigration. We thank these amazing managers and scholars for enriching our discussion. Between delicious plates of food and aromatic glasses of wine, we heard various discussions about IPO’s in Canada in comparison to the United States, UofT Engineering, learning code, key steps to starting a business, and experiences of attending graduate school. We’d like to thank the amazing women and men who joined us for this inspirational night and ask all of you to stay put as ICUBE and Thomson Reuters will continue to collaborate and bring you quality events!